We’ve already gotten used to exotic automakers offering a wristwatch to go with their four-wheeled creations, but now we are talking about an aftermarket company that decided it was time to do the same thing for their rich clientele. 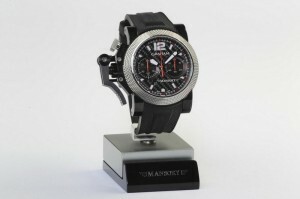 The company in question is Mansory, who have teamed up with Graham London, the same watchmaker that makes custom wristwatches for the Mercedes GP team. The result is the Chronofighter Oversize wristwatch, which will be offered in a limited run of just 50 units, at the price of EUR8,900 (about USD12,500 at the current exchange rate). The self-winding automatic chronograph developed by Graham, is exclusively available from Mansory or one of its world-wide sales partners. The watch comes with a 47 mm steel case diameter and the left hand fast-action start /stop trigger, and the dial is made of carbon, a material typically used for sportscars. The “Clous de Paris” decorated steel bezel echoes the artistic performances of Mansory concept cars. On the case back, a smoked see-through sapphire crystal with Mansory logo, allows an insight into the clockwork Calibre G1734 with 48 hours power reserve. The black rubber strap is “Clous de Paris” decorated and adorned with the Graham and Mansory logos. “The co-operation with GRAHAM-LONDON derives from my long-term friendship with Eric Loth, founder and board member of GRAHAM-LONDON. His passion for dynamic automobiles and my enthusiasm for high-quality chronographs are perfectly combined. The GRAHAM MANSORY Chronofighter Oversize confirms this in a very impressive way,“ said Kourosh Mansory, CEO of the MANSORY Holding & Design GmbH. This entry was posted in Authentic, Chronofighter, Fashion, SmartWatch, Sports Watch, Watch and tagged carbon, exotic, graham, luxury, mansonry, mansory, mercedes, sports cars, trigger, wrist watch. Bookmark the permalink.